242 athletes from the U.S. Olympic Team have traveled to Pyeongchang in South Korea to compete in the 2018 Winter Olympic Games. This year, leading the U.S. Men’s Hockey Team is retired U.S. Marine Lieutenant Colonel Sean Braziel. Sean has had impressive careers in both the military and in hockey. He played hockey at Iona College and declined offers to play professionally in Europe because he wanted to serve his country in the military. 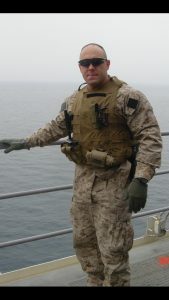 In June of 2016, after 20 years of service and a career that spanned intelligence analysis, policy, operations and 13 deployments, Sean retired from the Marine Corps. 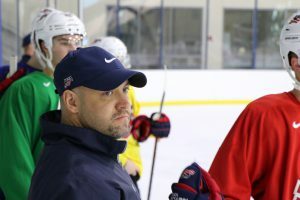 His military service, training and leadership prepared him for the next chapter of his life—hockey coach and talent developer. On and off the ice, Sean works with USA Hockey’s National Team Development Program, and in 2017, he was the Team Leader for the U.S. National Junior team that won gold. These accomplishments have led him to his role of Team Leader for the 2018 Olympic Games. Hope For The Warriors views Sean’s successful transition from service member to hockey coach as an example of how transition is a unique journey for every individual. For Sean, sports and art therapy have been crucial tools in helping him face the challenges associated with transition. Now, Sean wants to continue to give back to the military community by helping younger service members realize organizations like Hope For The Warriors are there to support them. Hope For The Warriors knows that no two transition experiences are the same. That is why we take a comprehensive approach to meeting the needs of the military community. Apply for Hope For The Warriors services here and we can connect you with our different programs. Good luck to Sean and the entire U.S. Olympic Team competing in Pyeongchang! Click here to learn more about the U.S. Men’s Hockey team and find their schedule.